Slate Falls Press: Artistic Differences Blog Tour & Giveaway! Artistic Differences Blog Tour & Giveaway! 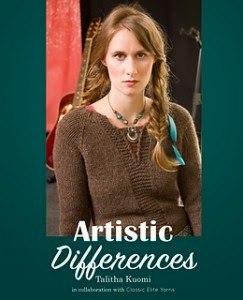 Today we are delighted to be a stop on the blog tour for Talitha Kuomi's brand new publication, Artistic Differences. 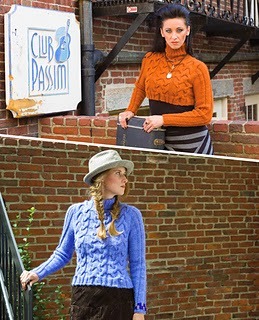 This pattern collection has been created in collaboration with Classic Elite Yarn. Inspired by her musical experiences, each of the ten patterns in the collection is designed to be styled in two different ways~ acoustic vs. electric, take your pick! We first met Talitha years ago when she very kindly reviewed a book of ours for the talented Jaala over at Knit Circus, and it is an honor to return the favor by being a part of the launch of this stunning collection! Talitha has been kind enough to answer our questions about her creative process, musical tastes, and design style. Enjoy!! When CEY and I first started talking about collaborating, they said that I could pick any theme. Anything at all. I knew almost immediately that I wanted to do something related to the local music scene and indie musicians. For awhile it was me and the guys in my band playing stage to stage in the Greater Boston area. 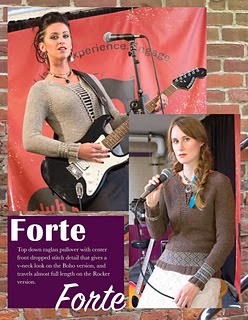 I loved those times and I’d seen very little to no patterns knit with indie music in mind. It seemed like a space waiting for me to fill it. I love how you have imagined each design in two ways… how did you develop this concept? Did it complicate or simplify the design process for you? Music is so many things. It’s rock, blues, gospel, country, folk, alternative, rap…it was difficult to think about capturing the essence of what music means to me in just one collection. Doesn’t help that I do find it hard to nail down the details of any pattern I’m designing. My head gets cluttered up with what something would look like with 3/4 sleeves, or more colors, or in a different length. The idea of each pattern with different modifications simplified things, because the variations come easy to me. Narrowing it down to only two variations (actually I cheated and gave a third mod possibility for each pattern in the book) was a bit harder, but worked. How long have you been a musician? How are songwriting and pattern writing similar and different? Aren’t we all born musicians? And we believe it until the world starts pointing out our lack of talent compared to the superstars. Then we don’t say we’re musicians anymore. I played the violin when I was young, then the piano. I sang at church and in the chorus at school through college. Then I did some solo acoustic sets and sang with my band as a grown-up. 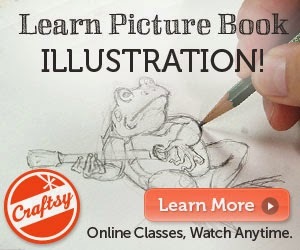 I have this strong need to make things. Whether that be music or knitwear, poetry or bulletin board collages. I feel better, think clearer and sleep better when I create. 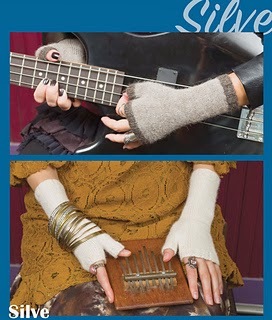 I think that’s why I’d say I’m a musician and a knitwear designer: my head spins with ideas that long to be set free. Always has. You’ll laugh here, but the real difference to me between pattern writing and songwriting is math. There is rhythm and balance and volume (which is measured in numbers), but thankfully no math in songwriting. That’s the biggest difference. The way it works for me, they have a lot of similarities. Both express strong emotions or memories (I know that’s not true for all designers, but it is for me), are cathartic, and the next person to sing that song or knit that sweater will do it a little bit differently, so they’re both extremely personal. Were there musical inspirations for this collection? What did you listen to while designing it? It’s all pretty mellow, which isn’t always my taste, but it was this time around. If you were an instrument, what instrument would you be? I hope I’d be a double bass. A little awkward, an effort to bring with you out and about, but with a rich, haunting sound so that once you’ve heard its place in music, it is hard to get it out of your head. That’s not necessarily what you’d think meeting me in real life, but that’s what I’d like you to think. What was the most challenging part of writing this collection? The most rewarding part? The most challenging thing and the most rewarding part are the same. Simplicity. I love the presence of complicated designs. Like a cabled cardi that has eight separate charts and looks ever so impressive when worn, but there’s not enough space in my life to knit stuff like that right now. My knitting has to be portable so I can bring it along to waiting rooms and school meetings. I have to be able to work it while simultaneously my kids are interrupting my thoughts and the phone is ringing and I’m not sure what’s for dinner yet and someone’s boo-boo needs a kiss and a big hug. I have to enjoy the process because I don’t get to the end of something that made me crazy to knit and then suddenly love it. Ever. 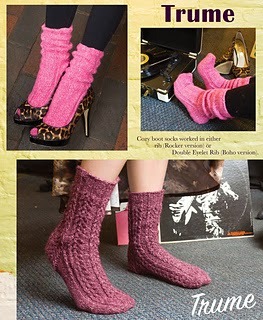 It seemed most honest to design things I’d actually like to knit. So, I wanted to take my original ideas and really shave them down to their core. That took the most time and the most work, and it’s the something that I’m the most horribly happy with the result of. 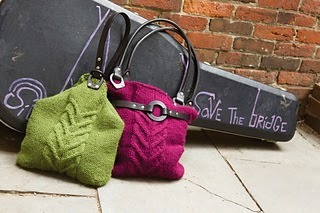 We are excited to be featuring the Trume pattern on this stop of the blog tour. 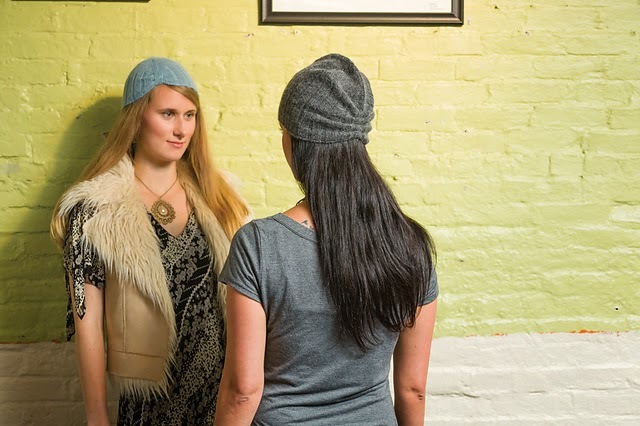 Just for today, Wednesday, January 7, this pattern will be on sale for 10% off. No code is needed. Also, one lucky commenter will win a free copy of this pattern. To enter: Leave a comment, including your ravelry name, website, or email address, and tell us which pattern in Talitha's collection is your favorite! Comments will close one week from today, January 14. Thanks! Comments are now closed to entries. Thank you! I love Forte! What a beautiful collection-it was hard to choose just one. Thanks for the giveaway...I'm jenniesanto on Rav. Setto is my favorite pattern of the bunch. I'd make the longer version. Thanks much. Savannagal on Rav. Angora socks sound pretty wonderful so I'm going to start with Trume. Might make one of each version in the same color. love the hat pattern Osci very unusual. I love Osci and would cast that on first. It has line that would be awesome for any musician to wear. Tensity is my favorite! I love bags so this would be a great addition to my collection! I love the Trume socks.